Some 23. 5% of all members and patients of treatment centers completed the questionnaire. One striking fact is that participation was highest amongst elderly patients with severe hemophilia, whereas only 12. 2% of family members responded. 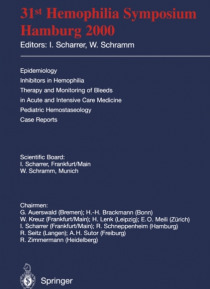 Evaluation of the results revealed that the majority of participants prefer treat- ment in a hemophilia treatment center with a high reputation, whereas only 2.… 7% consider treatment in a specialized practice to be sufficient. The reasons for that are the necessity of the 24-h-availability of a physician, regular qualified examination of joints and muscles, documentation of product batches, laboratory tests and good cooperation with other faculties. As many as 68. 9% of the patients sometimes travel more than 200 km. What certainly plays a role here is trust in the treatment center and its physicians, for it is noticeable that irrespective of the fact that 74. 3% re- quested standardized treatment regimens for all treatment centers, only about 20% would change to a nearer center. Treatment with factor concentrates is generally considered to be very safe. That is to say, 58. 1 % regard recombinant products to be very safe, whereas only 24. 3% assume this for plasma products. When compared, there were usually no major differences observed regarding outcome (factor consumption, duration of treat- ment). Increase in maximum storage temperature (47. 2%) and half-life (73%) were the most frequent answers to the question of what features the products should have.